My sincerest apologies for the lengthy delay since my last post! I could write a post itself on how busy my life has been in this time, but that’s not what you’re here for! Instead, let’s get started on Bookbinders Design! Bookbinders Design is a stationery store in Melbourne, and well-known amongst our Melbournite pen-lovers! I had heard a bit about the store from these members, who all have high praise for the physical store and the wonderful staff- if you’re in Melbourne, please do drop in and let me know your experience! I had also been intrigued by their site, which has a range of big-brand notebooks, diaries and a selection of pens. What piqued my paper-loving interest most of all though are the in-house made notebooks! Their Personalise page offers an overview of their offerings, but they offer a number of pre-made notebooks too with their in-house paper (milled externally), with both hard and soft covers, as well as wire-bound options, in a range of sizes. This in-house paper I keep referring to is listed as ‘High quality Swedish fine paper 100 gsm’, and was my primary interest in Bookbinders Design (and the fact I could have a notebook made to my exact desires). The paper is also Acid Free, Totally-Chlorine Free (TCF), and Age Resisting and Forest Stewardship Certified (FSC). 100gsm paper is typically a poor indicator for fountain pen friendly paper (generalisation alert: if it needs to be that thick, it is possibly too absorbative for fountain pen ink). However, I read a blog post by the wonderful Quillidyllic regarding the excellent fountain pen performance of this paper, and got in contact with Bookbinders Design. I spoke to them about creating a cheap notebook so I could review their paper- instead what I received was a personalised (initials on the cover), hard-cover, almost A4 sized creation with my choice of cover colour! This was generously provided for free by Bookbinders Design for review purposes. The layout, and customisation options, is part of what draws me to Bookbinders Design notebooks. If any of their regular creations don’t meet your needs (and that would be tough!! ), I’m certain you’ll be able to organise something to your liking. This notebook is almost square in layout, which is unique but an enjoyable point of difference! The hard-cover is cloth-bound and feels pleasant in the hand, as well as providing a lot more protection for your paper than most notebooks do with their soft-cover. Even with the hard-cover, the paper lays reasonably flat when opened, and the hard-cover provides a strong base under the paper if you’re on the run or on an unstable surface. Inside, I had 100 sheets/200 pages of blank, 100gsm Swedish paper, which has a lovely, silky-smooth feel to touch. Think of Clairefontaine Triomphe paper, and add a touch more thickness. In many ways, Clairefontaine Triomphe paper provides a very close comparison to the Swedish paper you find in Bookbinders Design notebooks. In an entirely subjective way, I find that the thickness of the paper adds a “luxury” feel to the paper, but I’m not sure I can quantify that statement. This paper is at the opposite end of the weight scale to Tomoe River paper, and you can rule out TR level performance off the bat. To be fair, I am yet to see any paper that performs close to TR yet, so this shouldn’t come as a shocking statement- and you definitely shouldn’t write this paper off on this basis! In terms of paper performance, let’s start with bleed-through. There isn’t any- done! As for ghosting, there isn’t too much to note either. You can see a hint of the writing on the reverse side of the page, but it isn’t much to note here. Only those who are super-serious about ghosting would have an issue, I feel. Indeed, in the Quillidyllic’s blog post, you can see that even with a ridiculous Pilot Parallel-looking writing, the paper holds up pretty bloody well, relatively speaking. So, some extremely positive signs so far! Feathering is where I expected to see some more issues (I assumed: thick paper -> more absorbative -> more featuring issues). I was again pleasantly surprised by lack of feathering! No real evidence of feathering for finer/drier nibs! So win no major issues so far, the attention turns to sheen. As this paper is more absorbative than Tomoe River, you see less sheen as a general rule. However, in the squares of ink on the left of the writing, there is still some hints of sheen. In Bilberry there is a nice hint, and Mars Curiosity shows more than I was expecting too. This sheen most likely won’t be clearly evident in writing (unless you go for a Pelikan nib with Organics Studios sheen-ers), but you may experience the occational hit of sheen, which is consistent with my experience of papers such as Midori MD, Leuchtturm, and Clairefontaine. Shading is an area where I am less fluent, mainly because my writing style does not suit pretty shading effects! Despite this, you can still see some shading in the Robert Oster NG Special ‘16 and FC Midnight Emerald, even if the colour variation is in weird places (again, my hand, not the paper!). Indeed, as this paper is more absorbative, it should facilitate shading writing more than Tomoe River papers will, if shading is your thing! Finally, I tested dry-time, and this became almost comical (in a good way)! I started with 0 to 60 seconds, but the rest of the marks were dry already by the 15 second mark! I then tried to break it down further than 15 secs, but got a slightly smudge at 3 second and nothing else!! Given these first two tests weren’t my wettest ink (Robert Oster Great Southern Ocean, for those interested), I went for a wetter ink and nib combination for the third test. Even with this ink, it was almost dry by 9 seconds, and definitely by 12. These numbers are very different from the 30-45 second times on Tomoe River paper, and the 20-30 seconds I find for most other paper! The last test (far right) was the single wettest ink/nib combination I have ever experienced, so I was not surprised that 30 seconds wasn’t enough! 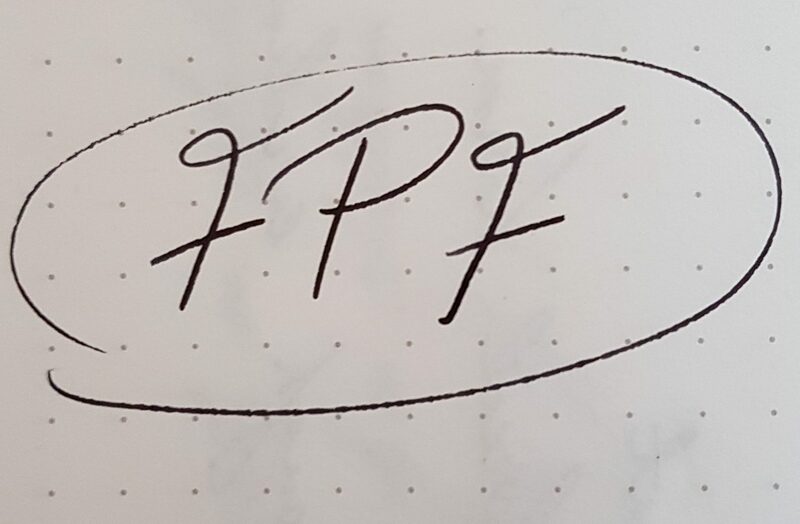 Overall, this paper is an extremely quick drying paper relative to other fountain pen papers, and particularly impressive when comparing to papers which don’t bleed and feather. In conclusion, this was a notebook that I was not expecting much from, and boy was I was pleasantly surprised! There are some excellent qualities for writing on this Bookbinders Design’s paper, and the notebooks come in a variety of sizes and styles, as well as being customisable! I see this notebook as being excellent for a work-place, as the paper won’t cause you issues of smudging or bleeding through the page, and has a luxury feel given the weight and smoothness of the paper. I will be looking to include a Bookbinders Design notebook into my daily carry (probably in an A5 size with a dot grid, maybe perforated), which is a line-up dominated by Tomoe River notebooks. I think this is the greatest testament I can offer about the quality of this notebook!